A music venue will be demolished and a Tube station enlarged from January as part of the £16bn Crossrail scheme. 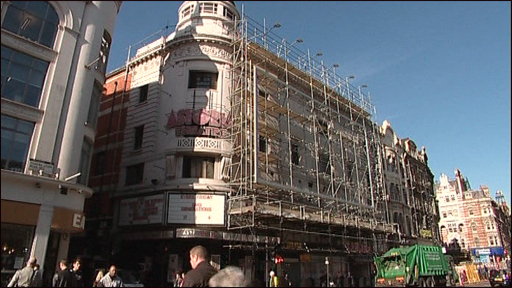 The Astoria venue is one of 13 buildings around Tottenham Court Road station that will be demolished before the station is extended. The compulsory purchase of the sites began on Friday , rail minister Lord Adonis said, in a "major step forward". The rail scheme will link Maidenhead in Berkshire to Shenfield in Essex via Heathrow airport and central London. The scheme to create an east-west rail route across London is the biggest transport project in the UK since the construction of the Channel Tunnel. It was approved by MPs in July and the first trains are expected to start running in 2017. Under the scheme Tottenham Court Road station in central London will become both an Underground station and a Crossrail station. As a result the station will be redeveloped and its ticket hall will become six times larger, with buildings around the site demolished. They include music venue The Astoria, which was built as a cinema in 1927 and a music venue which subsequently hosted bands including Nirvana, Radiohead, The Rolling Stones and the Arctic Monkeys. The compulsory purchase of the 13 buildings began on Friday and would be completed by the time work begins on the station in January, Lord Adonis said. "This is a major step forward in the delivery of Crossrail and underlines the government's commitment to the project," he added.